Platelet Rich Plasma Therapy (PRP) is a regenerative medicine technique using platelets which are concentrated from a blood sample and then injected into injured tissue to stimulate healing. The technique was first used clinically in 1987 and has found many applications in cosmetic surgery, dentistry, orthopedics, pain management and has even been used for sports injuries in many professional athletes. PRP uses the body’s own healing response in order to repair injured tissue for our Nashville patients. After an injury, platelets (which are present in the bloodstream) will attach to broken blood vessels to stop bleeding and bruising. Platelets attach to the injured vessels, stop the vessels from bleeding and then release growth factors to stimulate the injured tissue to repair or replace the injured cells. If the tissue does not fully repair itself after an injury, pain can persist for months or maybe years. Nashville PRP increases the platelets up to seven times the normal concentration and allow us to deliver a large concentration of growth factor-filled platelets directly to the injured tissue so that the healing process can resume. The process is simple. Whole blood, which is first drawn from one of our Nashville patients, then undergoes two stages of centrifugation (spinning down) to separate platelet-rich plasma from platelet-poor plasma and red blood cells. 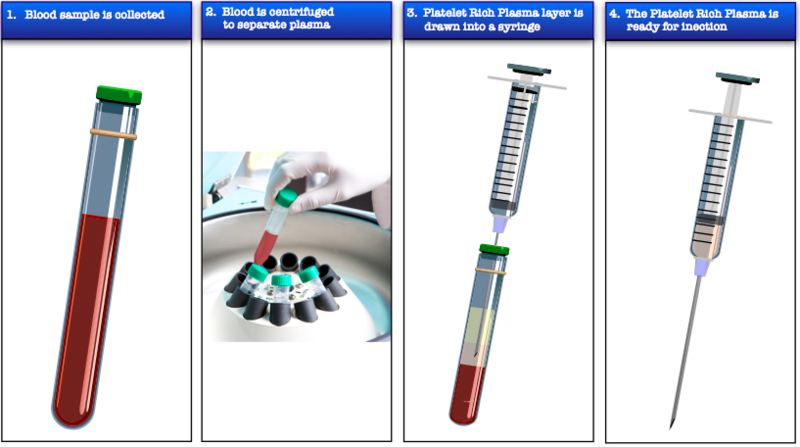 Once the PRP is separated from the rest of the blood components, Nashville PRP is drawn into a syringe. We then use either ultrasound or fluoroscope (x-ray) to help guide our injection so that the platelets can be delivered to the precise area of injury where they release their growth factors to re-start the healing process. Nashville PRP at our interventional pain clinics can be used to treat chronic musculoskeletal pain or injuries of the joints, ligaments, tendons and muscle. It has been shown to be beneficial for pain due to osteoarthritis of the neck, back, shoulders, hips and knees. PRP has also been used successfully to treat partially torn ligaments or tendons throughout the body. Nashville Platelet-Rich Plasma Therapy is a safe and effective procedure with a long track record of success in the treatment of joint, tendon, or ligament pain due to either trauma or age-related degeneration. At our interventional pain clinics located in Nashville and Hendersonville, we are committed to identifying the cause of your pain and utilizing various treatments such as our Nashville Platelet-Rich Plasma Therapy to help your pain. If you would like more information or would like to set up an appointment at one of our interventional pain clinics to discuss Platelet-Rich Plasma Therapy with our Nashville or Hendersonville board-certified physicians, please call us at Interventional Pain Center (615) 972-1100.